adidas Originals has a handful of upcoming adidas Ultra Boost releases, which includes this adidas Ultra Boost Uncaged Burgundy colorway for Fall/Winter 2016. Dressed in a Mystery Red, Collegiate Burgundy and Collegiate Navy color scheme. This adidas Ultra Boost features a full Maroon Primeknit upper with Charcoal detailing in the camouflaged patter, as well as its heel cage. 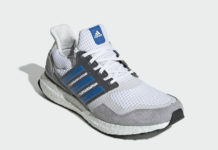 Completing the look is a clean White Boost midsole and Black rubber outsole. Check out the detailed images below and look for the adidas Ultra Boost Uncaged “Burgundy” to release later this year at select adidas Originals retail stores. The retail price tag is set at $180 USD.